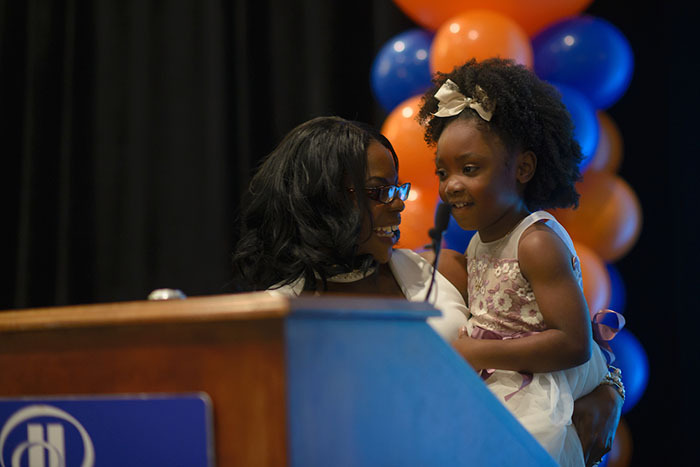 March 16, 2018 – Tenisha Wilson pauses before stepping onto the ceremonial platform at the Hilton UF Conference Center Friday afternoon. Patrick Duff, M.D., associate dean for student affairs, grabs her hand and squeezes it reassuringly. 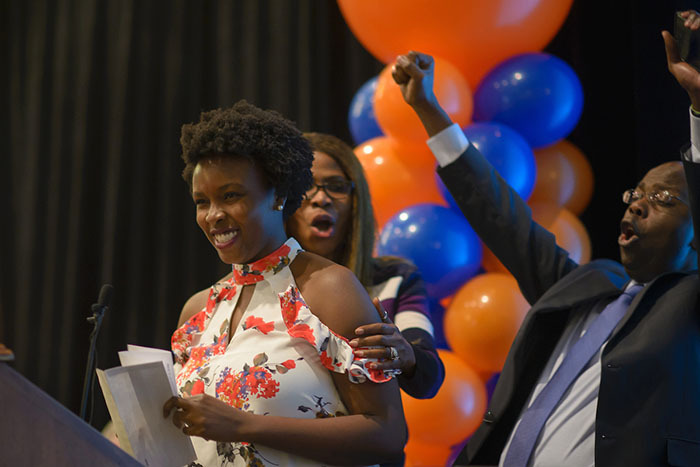 Then, Wilson – a fourth-year UF College of Medicine student and the first African-American woman to graduate from the UF MD-PhD Training Program – takes the stage. 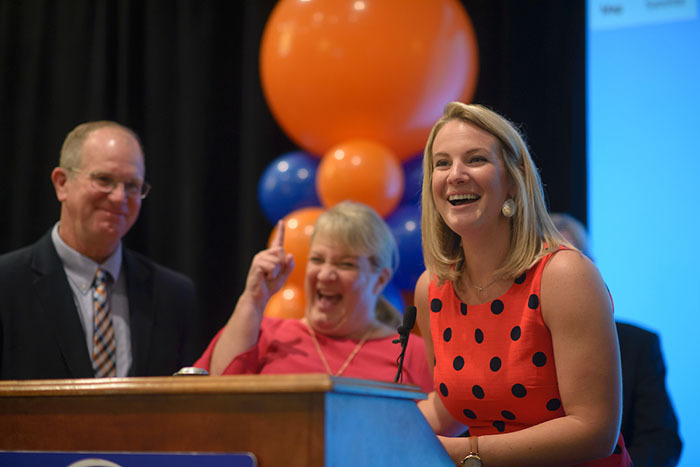 Her voice wavers as she introduces her parents to the Match Day crowd, the biggest crowd in UF College of Medicine history. 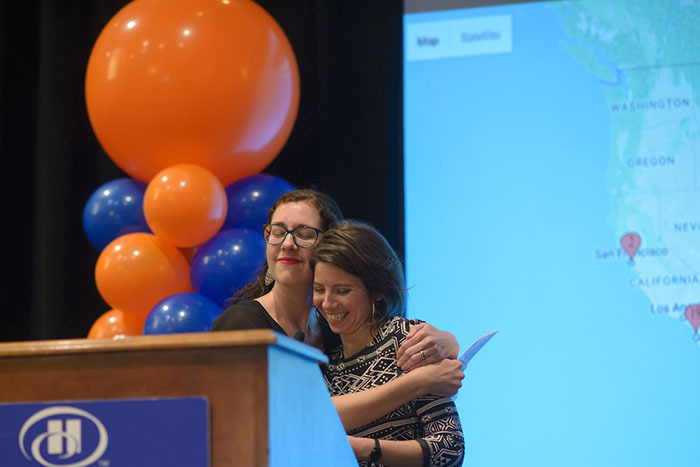 As Wilson opens the envelope revealing the location of the residency program in which she will study obstetrics and gynecology next year, the room quiets. Only Wilson’s rapid inhales and exhales sound through the podium microphone. “I will be serving the patient population of Baltimore at Johns Hopkins Hospital,” she announces. The room explodes in cheers and applause. 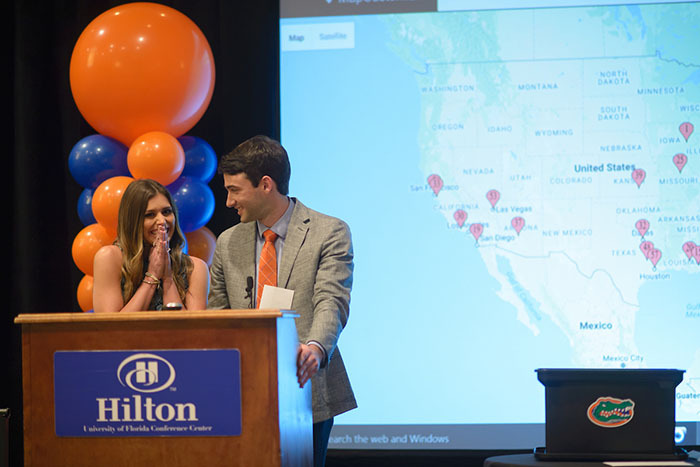 Wilson is one of 130 students in the UF College of Medicine class of 2018 who successfully matched into residency programs across the country. 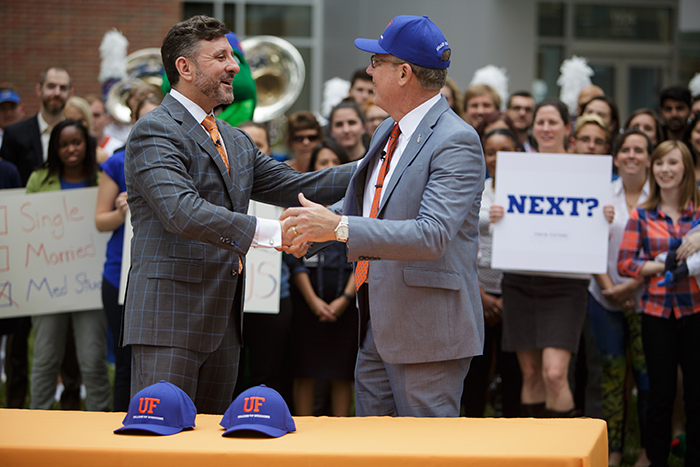 Twenty percent of the class will stay at the UF College of Medicine’s Gainesville campus next year, and 36 percent of the students will enter primary care residencies, encompassing pediatrics, family and internal medicine. 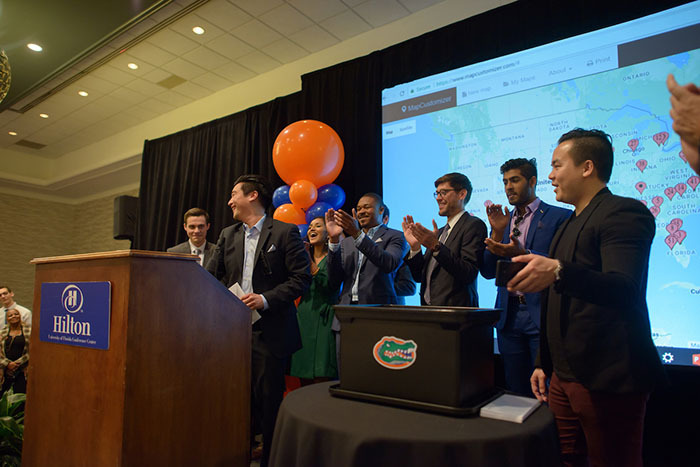 Michael L. Good, M.D., dean of the UF College of Medicine, began Friday’s ceremony by recalling his own match 34 years ago at the University of Michigan. Back then, he said, there were no e-mail notifications. Students had no choice but to open their envelopes onstage in front of their classmates and react naturally. 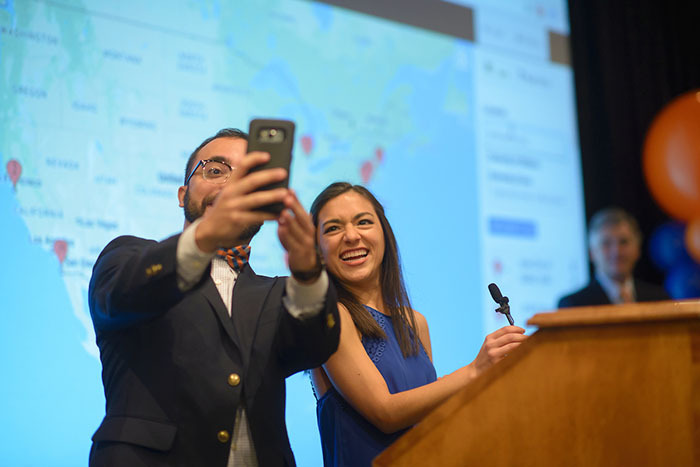 See a list of residency locations filled by the class of 2018. 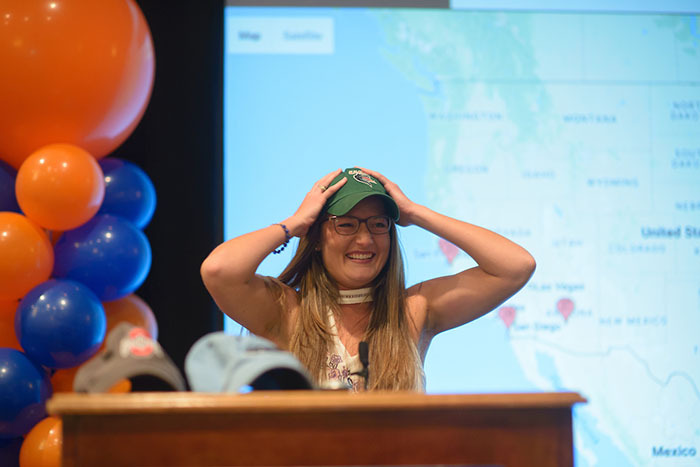 In the moments leading up to noon – the time appointed by the National Resident Matching Program as the moment to open envelopes across the country – Duff explained to the anxious students, family members and friends the long and grueling road to Match Day. On average, he said, students apply to 20 to 100 residency programs with the hope of achieving at least 12 interviews. Students then put together ranked lists of the programs they’d like to attend, and the programs put together their student wish lists. When fourth-year medical student Fritz-Gerald Charles opened his envelope on stage, he had his wife and mother on each side of him. 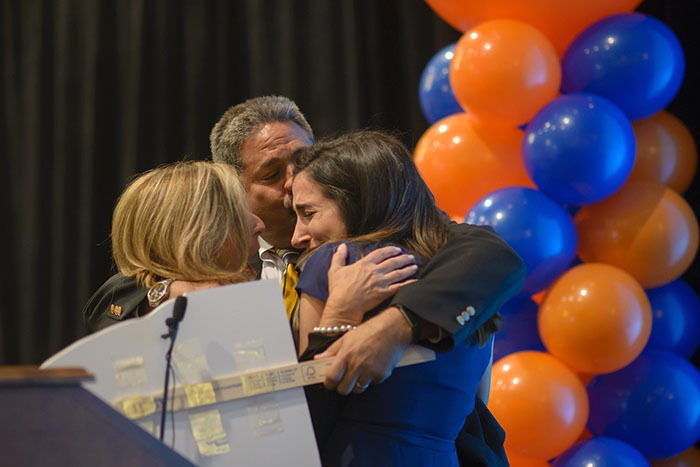 Before announcing his placement as an anesthesiology resident at the UF College of Medicine, he thanked the two women for their support. Fourth-year medical student De-Vaughn Williams has known his future was in medicine since the second grade. That feeling only grew as he volunteered with the UF Mobile Outreach Clinic and Equal Access Clinic Network through his eight years at UF. On Friday afternoon, he learned he would be pursuing his dream of studying internal medicine at the University of North Carolina Hospitals – Chapel Hill. With most of the crowd gone after the ceremony, Tenisha Wilson remains in the conference center, fielding phone calls, hugs and kisses from loved ones lined up to speak with her. Three photographers snap her photo as she holds multiple bouquets of sunflowers and carnations. Through the chaos, a wide smile remains on her face. “I’m overwhelmed with joy right now,” she says. 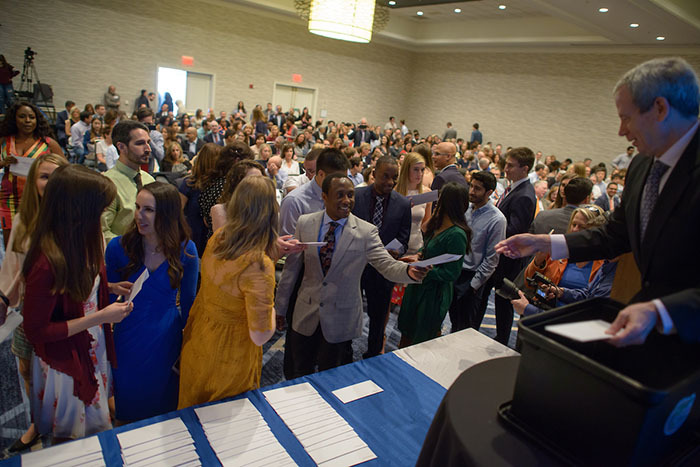 The UF College of Medicine also welcomes 215 new residents in Gainesville and 93 in Jacksonville who will begin their training in July.